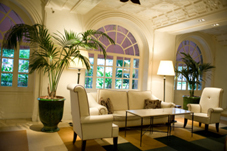 Indoor palm trees add a touch of the tropics to your home or office space. Palm tree house plants provide a variety of benefits – they add exotic style to your interior decor, purify the air you breath, and create a cool, relaxing atmosphere. 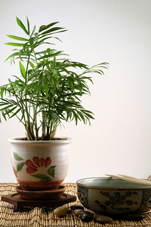 With proper placement, attention, and care, indoor palms will thrive and flourish in your home or office. The palm trees you choose will depend on the climate of you home or office, as well as your decorating style. They come in a variety of shape and sizes. Making the best choice will ensure your palms grow and prosper. Plant requirements should match the conditions in your home. The most important requirements to keep in mind include lighting, temperature, and humidity. 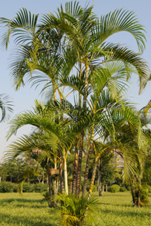 Consider a silk palm tree if you want the tropical look without the maintenance requirements. 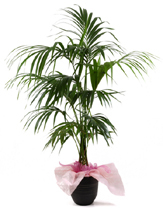 Indoor palms come in a variety of sizes and styles. Be sure to choose a size and style that complements your interior décor. Palms should look sturdy, clean, and healthy. Unhealthy signs include yellow leaves, wilted foliage, and spindly growth. Thoroughly check plants for signs of insects and disease. Indoor Palm Trees – What are Your Options? 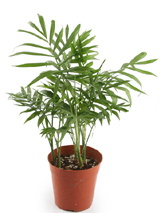 There are a variety of palms available that are suitable for your home or office. Review the list of palm trees below for options to consider.